« Credit Union Email: Phishing or Not? Our ancient Kenmore clothes dryer (Model 110.96282100 for maximal SEO goodness) developed symptoms suggesting the heater and overtemperature cutouts were in fine shape: it continued to turn and heat, but didn’t completely dry the clothes. In addition, it emitted a horrible whine that sounded like a bad bearing. The motor ran just fine, so Thermal Fuse 2 had never blown at 196 °F. The Operating Thermostat (along the bottom edge of the diagram) switches the 240 VAC heater off when the clothes temperature (actually, the drum exhaust temperature) exceeds 155 °F. 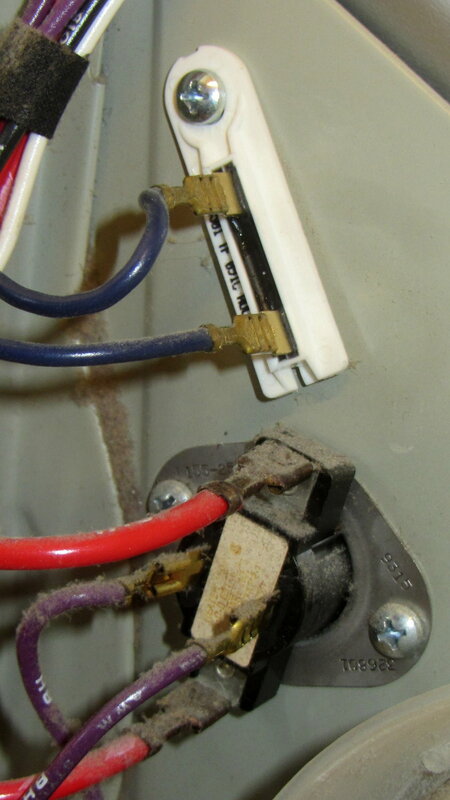 It’s in series with the non-resettable 350 °F thermal cutoff and the resettable 250 °F high limit thermostat, both of which were intact, as shown by the fact that the heater still worked. We generally run the dryer in Auto mode, with the Temperature Selector in the middle position. The Selector varies the resistance in series with the Operating Thermostat heater (near the middle of the diagram), controlled by Timer Switch 1: increasing resistance reduces the heater current and requires hotter clothes before the Thermostat trips. For the first part of the cycle, the BK-BU contact closes to allow the Selector to affect the current. The BK-V contact also closes during the last part of the cycle, cutting out the Selector and letting the Thermostat hold the clothes at 155 °F by cycling the drum heater. You can do that from the back of the dryer without dismantling it, by removing the rear cover. 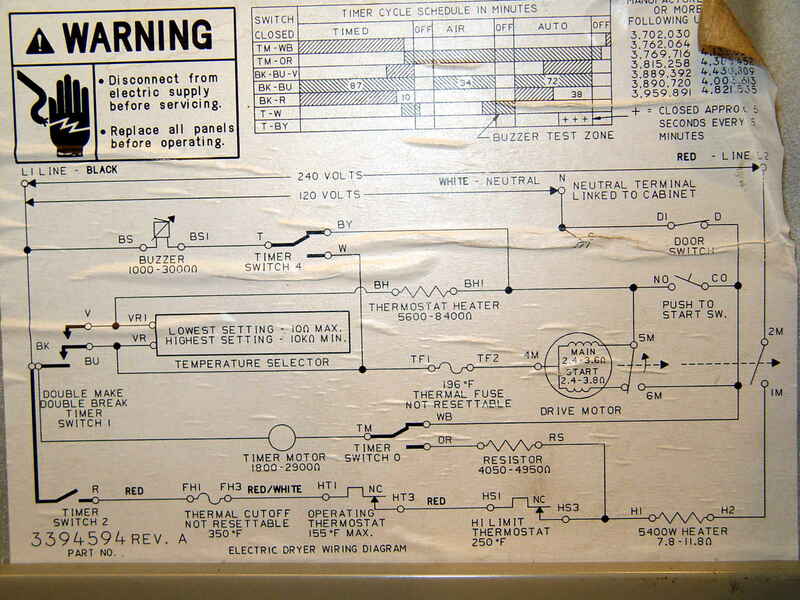 For whatever it’s worth, the replacement Operating Thermostat heater has a 74 kΩ resistance, not the 5.6 to 8.4 kΩ range shown on the wiring diagram. Preliminary testing suggests it does what it’s supposed to, so maybe they’ve improved (and, surely, cheapnified) its guts to work with 1% of the original power. More likely, the Temperature Selector now doesn’t do anything, as its (minimum) 10 kΩ resistance on the High setting doesn’t amount to squat compared with the new thermostat heater, but we don’t have enough experience to say anything definite. In an attempt to fix the whine, I took the whole thing apart to replace the idler wheels supporting the drum, the drum drive belt, and the belt tensioner pulley. The interior of the dryer is filled with sharp edges and hatred, so expect some bloodshed. After reassembling the dryer, the heater worked fine. The whine also worked fine, much to my dismay. So I took it all apart again, removed the plate covering the duct from the drum exhaust port to the blower wheel on the motor, removed a generous handful of lint from the middle of the blower wheel, extracted a pile of debris from the bottom of the duct below the wheel, vacuumed everything in sight, reassembled the dryer, and it now sounds great. Along the way, a small square brass (?) rod fell out of the debris, sporting one shiny end, well-worn to a diagonal slope. I think the rod got trapped between the duct and the back of the blower wheel, where it would produce the whine only when the motor got up to speed (thus, sounding OK while hand-turning the motor). The accumulated debris & lint held it in place, so flipping the dryer on its face and rotating the motor in both directions had no effect: turning the dryer upright simply let it fall back into the same position. No pictures, alas. We did the second teardown in a white-hot frenzy to Get It Done and swept the brass rod away with all the other debris. This entry was posted on 2017-03-13, 07:07 and is filed under Electronics Workbench, Home Ec, Machine Shop. You can follow any responses to this entry through RSS 2.0. Both comments and pings are currently closed. Guessing the small square brass rod fell out your pocket during the laundry cycle from a project? Certainly doesn’t sound like a typical part from a dryer unless an electrical component (switch, timer) came apart. I have found a few things in the washer basket before like nuts, washers, etc., but not too much in the dryer (melted chapstick was probably the worst). Totally unrelated, but a friend had stepped on an 8 pin DIP some 30 years ago in bare feet. I swear he said the leads crimped over from the force. Still gives me the willies to this day thinking about it! That fuzzball contained a fair number of beads, a dusting of glitter, a 1×1 Lego brick, charm bracelet stuff, and so forth: evidently, we’ve been shedding parts all along. Rule One in the Shop: Shoes will be worn! Mine made such a whine a while back, so I took it apart to find the drum supported not on idler wheels but on rub pads, which had pretty much rubbed away. I bought a pair, only to find that their “each” is a pair, so now I have a spare set (including a tube of the special lubricant for them). I also cleaned everything and replaced the belt. It ran beautifully for the next few years, but when I moved house, I left it behind, as the next house had a nicer dryer. Note: the washer has now followed me for three houses, as apparently its drum spider assembly doesn’t decompose like many others do. The drum rides on those wheels in the back and the front has a plastic rim sliding on a ridge around the door, with a fuzzy felt seal surrounding the whole mess. I can’t imagine any reason why it hasn’t worn out, other than that they did a great engineering job back in the day. We’ll leave this one behind, fer shure! Also, some dryers (Whirlpool I know) are not happy with manual rotation of the drum, at least in one direction. 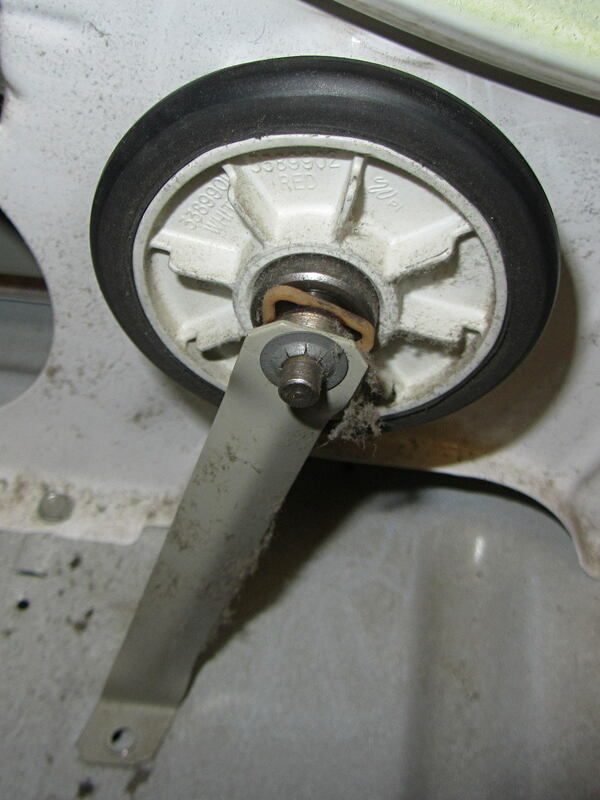 I had to reinstall the belt on the motor pulley (and get rid of a huge amount of pumice-dust and lint) when I tried that. The two Kenmores I had never minded, though. The seals look good, if only because I replaced the rear one a while ago. The tensioner pulley doesn’t like turning backwards, but it won’t disembowel itself in protest. Which is a Good Thing, because you’d have to dismantle the entire dryer to reassemble it, as you well know.